The rocketing popularity of the vitrified tiles in the construction industries has augmented the requirement of the same and therefore industries associated with are adopting the cutting edge technology to amplify the production and meet the high call of the vitrified tiles, wherein the successful transportation of the tiles is equally vital and therefore selecting the right type of conveyor belt is sagacious. To fulfill the demand of the vitrified tiles conveyor belt, we are here with the heavy duty conveyor belt whose dot pattern design imparts significant grip, hence ensure impeccability even at the faster speed or inclined conveying of the tiles, whereas robust material of construction (vulcanized PVC/PU) & multi layer configuration imparts by far strength to the belt to endure heavy loads without failing. There is no any concern of the sharp edges or the high impact strength as the provided vitrified tile conveyor belt has excellent resistance against abrasion, cut and heavy load and therefore the most reliable approach for such products. This conveyor belt is also reckoned as the heavy duty conveyor belt for its characteristics, which one can use for the any type of tiles, marbles, granites, stones and analogous material at the maximum efficiency. This vitrified conveyor belt has gone popular in the market for its availability of the extensive assortment and holding the promise they make. 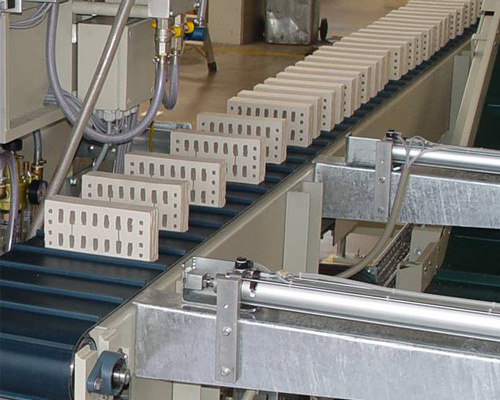 Whether you require this tile conveyor belt with cleats, sidewalls or different profile patterns, we are savvy to provide custom made solution in regard. The both ranges of the proffered vitrified conveyor belt comply with the quality and safety standards and outperforming under the harshest environmental conditions spotlessly.